Our Toxic World deals with what is probably one of the most serious problems in the world today — toxicity. However, the approach it takes is a little different. Author Aniruddha Sen Gupta chooses to tell the story through pictures. Placing a family called the Sachdevas at the helm of this toxic hellhole, Sen Gupta weaves a story about the world we are living in. Our Toxic World book cover; courtesy of Toxics Link. Mohanlal Sachdeva is a compliance inspector of boilers and factories. His job is to ensure that only environmentally friendly companies are permitted to conduct operations, but with so much smog and pollution around, there’s little he can really do. His wife Rajeshwari often unwittingly brings the pollution into her own house. Anamika, their daughter, is often sick, unaware that it’s the toxicity around her that’s the culprit. Their son, Prasad, tries to make a difference to the world through his occupation. Other characters appear throughout the book, as the Sachdeva family deals with issues such as green architecture, pollution, e-waste, and toxicity in consumer products, among others. The book is essentially divided into two parts — stories and information about different kinds of toxic elements. Using graphics in both sections, Sen Gupta tries to inform and also entertain. 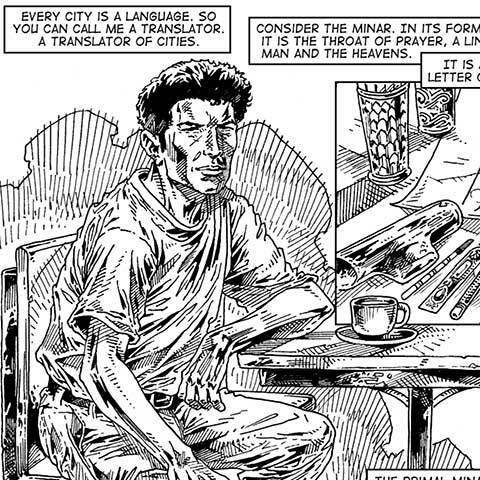 The concept of using a graphic novel format for a book like Our Toxic World is innovative and interesting. Illustrations break down the monotony of the text, that could have so easily made it a preachy read otherwise. The text still remains instructional; however, the sketches provide a welcome distraction. Priya Kurian, who has earlier made gorgeous illustrations for books like the Taranauts series and A Blind Man’s Map of Mumbai, wields her sketching equipments with dexterity here as well. However, the book’s merits are also its bane. True, the pictures are eye-catching and you don’t feel like you’re wading through pages of preachy literature, but at the end of the day, the content assumes the tone of a dissatisfied and forceful teacher — it tells you what to do and what not to do. With such an approach, it’s won’t be surprising if you end up skipping pages and catch up only on the stories. Instead of trying to read it like any other graphic novel, I suggest you read it in parts, dealing with each chapter at a time. It will feel less harrowing and more fruitful. At a time when activists in this part of the world are crusading against the alleged presence of toxic waste around the Bhopal gas tragedy site while the oil slick in the Gulf of Mexico is causing tumultuous political and industrial developments in the First World, we must truly enlighten ourselves on the subject. Its contents may not always be the easiest read, but it cannot be denied that its subject is more important than most of us would like to admit. Our Toxic World may not qualify as a very entertaining read, but it’s certainly food for thought. Resident of the insomniac city, Sohini spends most of her time writing all sorts of things. Nothing tires her more in life than monotony and convention and she’s on a constant mission to break out. She has a reputation for being serious and intimidating, tags she has lately begun to enjoy. Friends and worried parents however know that she is, in fact, quite bonkers!